Luke Abbott's school is the losing-est school in the history of losing. And that's just fine for him. He'd rather be at home playing video games and avoiding his older brother Rob and the Greatest Betrayal of All Time. But now he's being forced to join the robotics team, where surely he'll help uphold the school's losing streak. He'll also meet a colorful cast of characters, including: Mikayla, the girl who does everything with her toes; Jacob and Jacob, who aren't twins but might as well be; the sunflower seed-obsessed Stuart; and Missy the Cruel, Luke's innocent-looking bully since they were six-years-old. But it's an unlikely connection with a mysterious boy known only as "Lunchbox Jones" that will change Luke's life. Turns out, Luke and Lunchbox Jones have a lot more in common than just robots . . . .
With nonstop laughs and enough heart to make even a mechanical robot shed a tear, Jennifer Brown's new book is poised to secure her status as a middle-grade author to know and read. 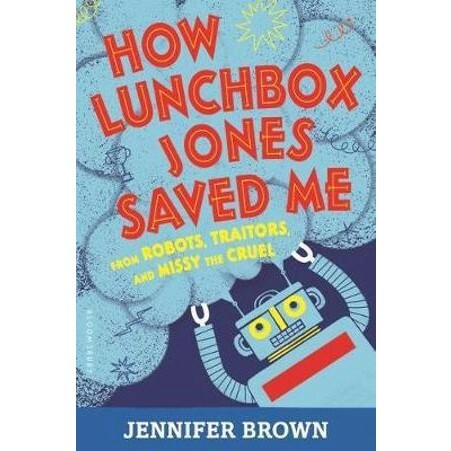 Jennifer Brown is the author of the middle-grade novels How Lunchbox Jones Saved Me from Robots, Traitors, and Missy the Cruel and Life on Mars, a 2015 CCBC Best-of-the-Year Pick. She's also the author of the highly-acclaimed YA novels Hate List, Bitter End, Perfect Escape, Thousand Words, and Torn Away. She lives with her family in Kansas City, Missouri.